Learn the basics of ice climbing and try a variety of routes on beginner/moderate terrain. Climb your way up more challenging terrain and understand the techniques that help you climb on steep ice. Experience what it’s like to climb on a mix of rock and ice using your ice axes and crampons as effective tools. Meeting Place: The Nipigon Legion (102 5th Street). 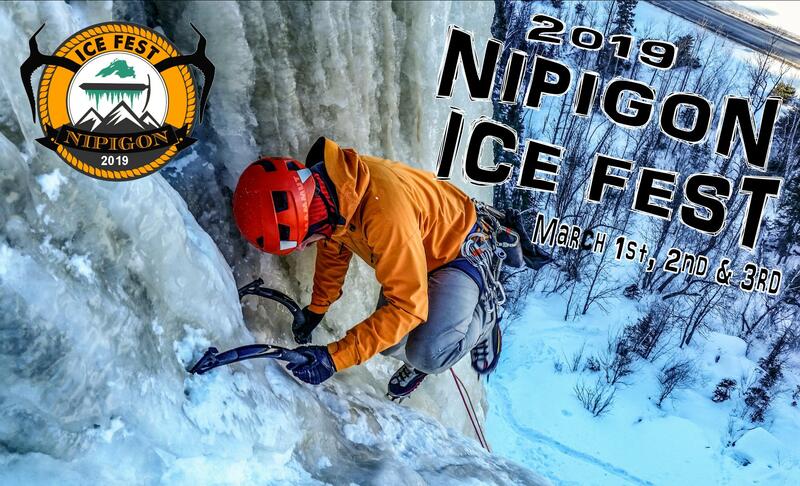 Climber Check-in begins at 7:30am for ice climbing participants. 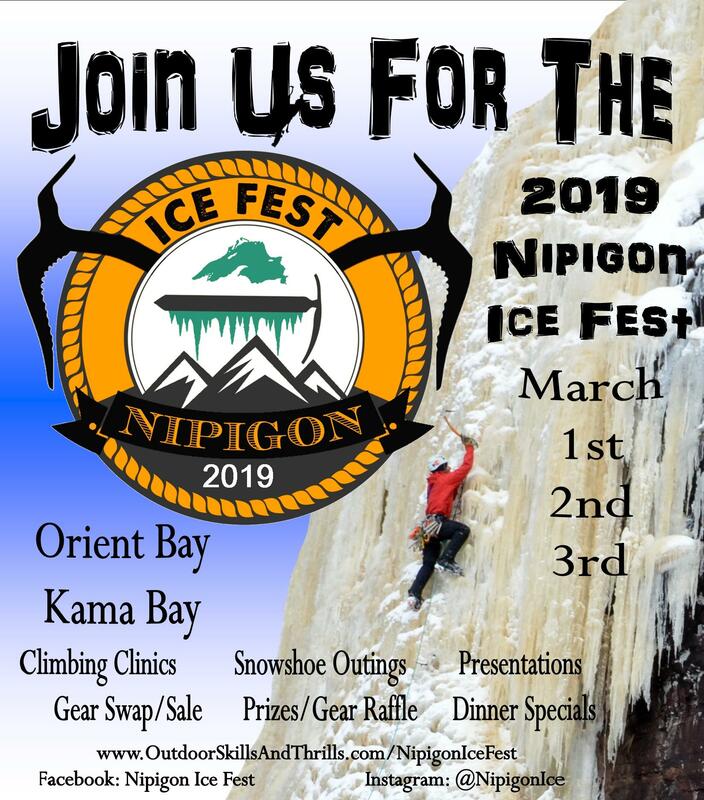 Departure time is 9:00am from the Legion for ice climbing participants. Transportation is not included; you will need to arrange your own way to and from the climbing location. Unite – Learn – Explore! After Submitting your Reservation: Each climber is required to fill out a Registration Form online. Please do this as soon as you’ve submitted your payment. This is to ensure we have all the information needed to provide you with the best possible experience and the properly fitted equipment. Equipment Rental: Equipment rentals are available on a first-come-first-serve basis. All equipment will be transported to the Legion for the clinic and distributed and the climber check-in Saturday morning. Any extra gear will be made available to rent at the Legion prior to the outings. Harnesses and Helmets are available at no extra cost by Outdoor Skills And Thrills and the UMD. Limited supplies, so let us know exactly what you will need when you register. Waiver Form: You will be required to sign our waiver form before commencing the program. Participants under the age of 18 will need their parent/guardian’s permission to complete registration. Minors who show up for an adventure or course without a properly signed waiver by their parent or legal guardian will not be allowed to participate. If you do not have access to a printer prior to the Ice Fest, we will have paper copies available upon your arrival at the check-in. Transportation: Transportation is not included, so you will need to arrange a way to and from the climbing spot. If you are open to carpooling let us know and we can try to help you arrange this with the other participants at the climber’s check-in on Saturday. Cancellation & Refund Policy: Once a booking is submitted, we hold a 50% non-refundable deposit of the total cost, and the full amount becoming non-refundable 14 days prior to the clinic. All requests for cancellations or date changes must be submitted in writing to info@outdoorskillsandthrills.com. Please notify us as soon as possible if you wish to make any changes to your reservation. We reserve the right to cancel any program due to weather or route conditions, guide health, or for any other reason deemed necessary by the Nipigon Ice Fest committee. In such cases, we are not responsible for expenses incurred by the client in connection with the trip such as airfare, car rental, equipment purchases, etc. By its very nature, climbing is an uncertain endeavor, and many factors can influence the outcome of a trip. Accordingly, once a trip begins, we are unable to offer refunds for weather related cancellations, or for trips that end prematurely due to weather, route conditions or circumstances within, or affecting, your group.